the North Atlantic, south of Shannon Airport, some 100 miles northwest of Galley Head. This memorial gave due emphasis to the role of the Canadian aircraft carrier Bonaventure, as well as to the Swiss rescue ship Celerina and the Flying Tiger. Led by Bromore resident Michael Flahive, some 50 area residents came together to reminisce on the event and the stir it created in their neighborhood. Flahive was only 5 years old at the time, but has vivid memories of the “giant” aircraft carrier pulling into the Shannon River estuary below his home and anchored there for several days. Indeed the Bonaventure must have taken on a gigantic and mysterious appearance in comparison to the many smaller commercial vessels commonly seen at the time. interest in beach combing for ocean treasures and in the Flying Tiger incident itself. He said on one beach-combing venture, he and his brother came across a sealed plastic emergency kit which was one of many that had been dropped by British aircraft in the region of the ditching in hopes that survivors might find the supplies. Inside they found emergency rations, first aid supplies and a seawater to fresh water distilling unit. Flahive said that he and his brother turned over the emergency rescue package to the local police, as they believed they should. The local authorities said they would hold the package for a year and if no one came in to claim it, the boys could claim the package for themselves. A year later the box was theirs but the box was empty. All of the contents had been claimed by souvenir seekers. 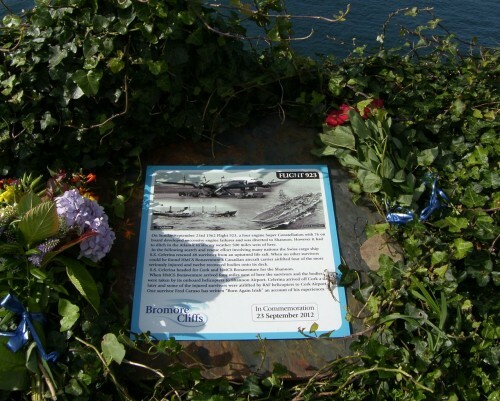 The memorial plaque on the Bromore Cliffs is embedded in a pad of concrete and surrounded by ivy greenery. 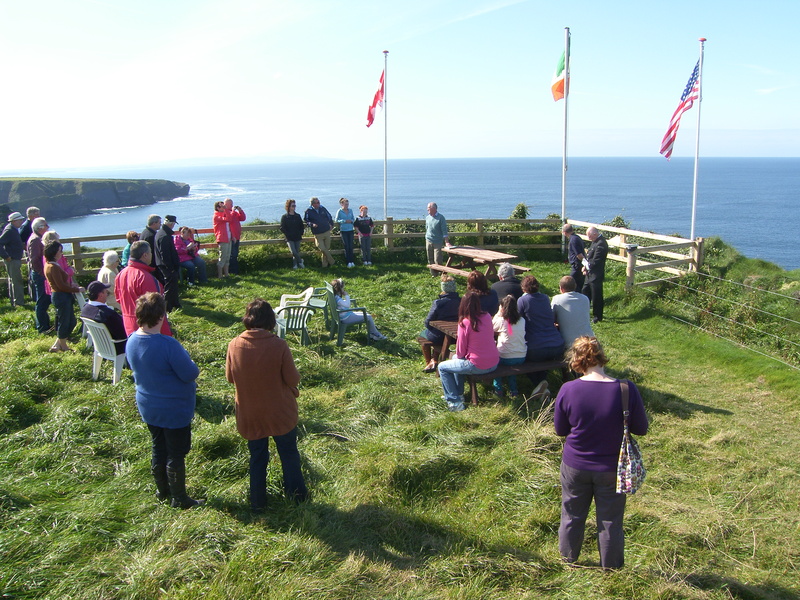 Attendees at the ceremony shared memories of the 1962 event, heard a summary of the Bonaventure’s contributions, and listened to readings from a book about the crash, Fred Caruso’s Born Again Irish. 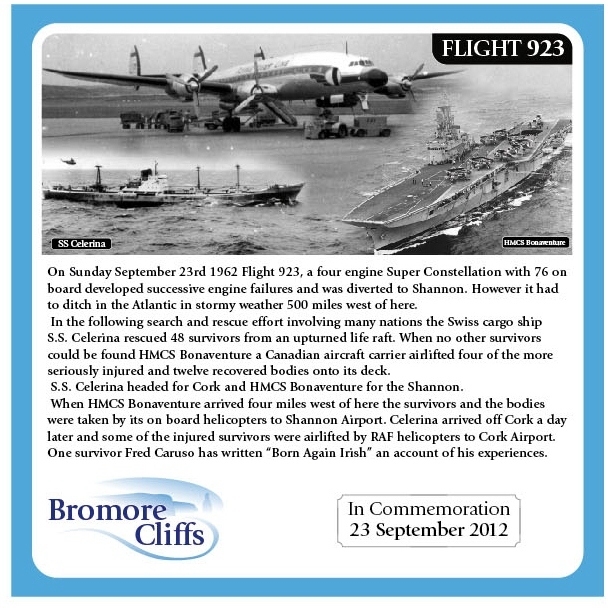 This entry was posted in MEMORIALS and tagged Bromore Cliffs, Bromore Cliffs Memorial, Flahive, Flying Tiger Memorial, Mike Flahive. Bookmark the permalink. Just wanted to let you know that Dorothy (Miskimen) Neisen passed away on May 15, 2018. She was the widow of Richard McMunn Miskimen.